Eye exams for children are extremely important. Experts say 5% to 10% of pre-schoolers and 25% of school-aged children have vision problems. Early identification of a child's vision problem is crucial because, if left untreated, some childhood vision problems can cause permanent vision loss from disease. For school-aged children, the AOA recommends an eye exam every year or according to your eye doctor's recommendations. Be sure to tell your optometrist if your child has a history of prematurity, has delayed motor development, engages in frequent eye rubbing, blinks excessively, fails to maintain eye contact, cannot seem to maintain a gaze (fixation) while looking at objects, has poor eye tracking skills or has failed a pediatrician or pre-school vision screening. It is recommended that an infant’s first eye examination be at the age of 6 months. At this point, we can make sure the visual system is developing properly as well as the structures inside the eye. If any hindrances to visual development are detected, early intervention can be provided to ensure healthy and normal development. Vision, unlike the other senses, is under developed at birth. Vision then quickly develops after birth, to where a smiling face can be seen at about 1 month of age, and then colour vision is achieved at about 2-3 months of age. Depth perception and vision keep progressing as the infant gets older unless there is something hindering development. Hindrances to visual development can range from a congenital cataract to a high spectacle prescription that may lead to amblyopia (“lazy eye”). If something like a cataract is found at this age, surgical intervention can be initiated. If something like high spectacle prescription is found at this age, we may prescribe spectacle correction or monitor. For clear vision to development, the eye must possess the ability to see clearly, if there is a condition like amblyopia then the eye cannot see clearly and thus will not develop the ability to see clearly. We typically like to treat amblyopia before the age of 6, however the earlier the easier and more successful treatment is, as the brain is more “plastic” at a younger age. Therefore, if there is a significant spectacle prescription, your eye doctor may prescribe glasses at as young an age as 6 months. These glasses are given to ensure proper visual development is achieved, allowing the child to have clear comfortable vision for the rest of their lives. 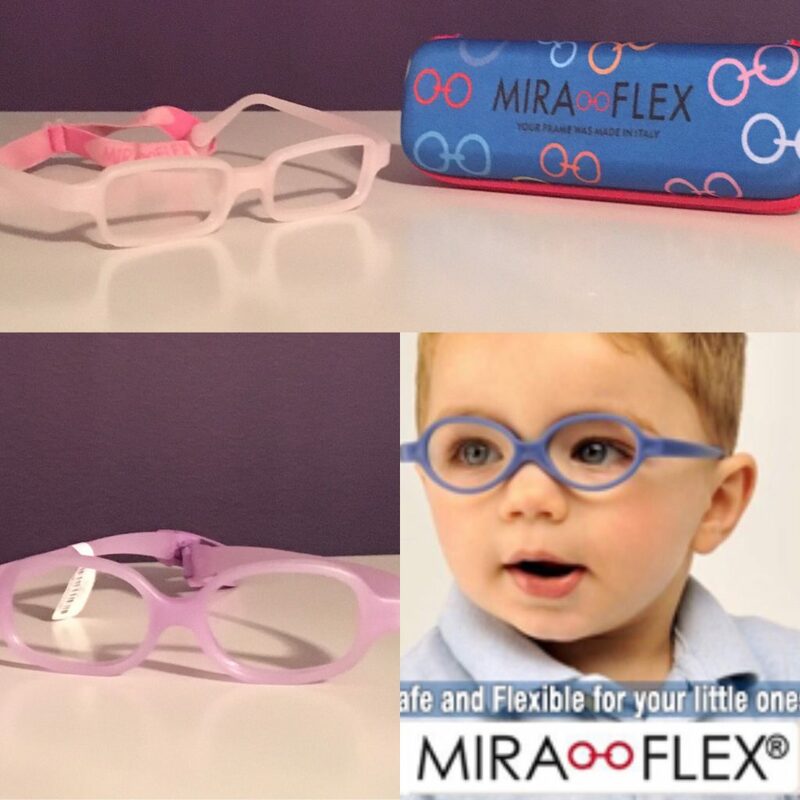 When looking for spectacles or glasses for your child, some eye doctors who deal with a lot of children will carry brands like Miraflex; which are flexible, non toxic, hypoallergenic spectacles that work well for infants and toddlers as well as older children who are rough on their spectacles. Our office deals with many children and infants and thus we carry this Miraflex line for these patients. Retinoscopy is a test that involves shining a light into the eye to observe how it reflects from the retina (the light-sensitive inner lining of the back of the eye). This test helps eye doctors determine the child's eyeglass prescription. Also called “lazy eye,” this is decreased vision in one or both eyes despite the absence of any eye health problem or damage. Common causes of amblyopia include strabismus (see below) and a significant difference in the refractive errors of the two eyes. Treatment of amblyopia may include patching the dominant eye to strengthen the weaker eye. This is misalignment of the eyes, often caused by a congenital defect in the positioning or strength of muscles that are attached to the eye and control eye positioning and movement. Left untreated, strabismus can cause amblyopia in the misaligned eye. Depending on its cause and severity, surgery may be required to treat strabismus. This is the inability to keep the eye comfortably aligned for reading and other near tasks. Convergence insufficiency can often be treated successfully with vision therapy, a specific program of eye exercises. Children with focusing problems (also called accommodation problems) may have trouble changing focus from distance to near and back again (accommodative infacility) or have problems maintaining adequate focus for reading (accommodative insufficiency). These problems often can be successfully treated with vision therapy. Many eye teaming (binocularity) problems are more subtle than strabismus. Deficiencies in eye teaming skills can cause problems with depth perception and coordination.